A Chimney Sweep is one of the area’s foremost chimney sweeping firms, an experienced chimney sweep working in Staffordshire, Shropshire and Cheshire areas. Both HETAS Approved and a member of the Guild of Master Chimney Sweeps, you can be confident that when you choose A Chimney Sweep, you will receive a premium quality service. Having used this company on a previous occasion during which I found his service to be exceptional I decided to use him again to see if the service he had provided on that occasion was because I was a new customer. I need not have checked as the following visit was of the same standard , agreed a time for the visit, arrived on time, cleaned both the chimney and the back boiler flu,created no mess and disposed of the soot. He was polite and friendly and provided advice on fuels and any other questions as well as the service all at a very reasonable cost. I have no hesitation on recommending him. Very happy with work done on my Trianco Fire. Be grateful to have the same done next year thanks to Simon Guyholt. Very impressed, good clean job. Excellent - been my chimney sweep for many years. Prompt with appointment, quick and clean with no dust or mess. 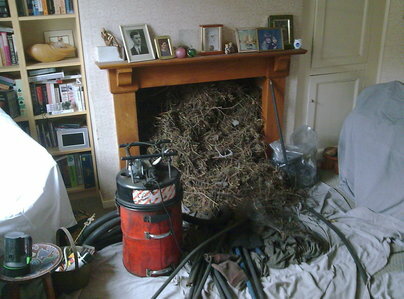 A Chimney Sweep was brilliant, no mess anywhere, soot taken away. Fast efficient service. I found work was thorough and professional. Would not hesitate to recommend him. Also explained work carried out. A job well done! Arranged appointment where I did not have to take time out of work.